You get to choose who represents you in the courtroom – and that choice is important. Most people want someone who is experienced and assertive in the courtroom, yet kind and caring when interacting with clients. At our firm, you get continuous attention and advocacy from our legal team. We conduct our practice out of a remodeled home in Shreveport, Louisiana. We are conveniently located and easy to find. If you are in the hospital after being injured in a car accident, contact our office. We will visit you in your hospital room to discuss your case. If you come to our office to discuss your legal matters with us, you will find a comfortable, caring environment where you can feel relaxed as you tell us about your custody issue, criminal charge or accident claim. 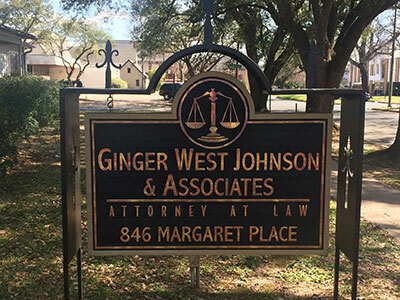 As an experienced family law attorney, Ginger West Johnson works closely with every client she serves. Our firm is known for our level of communication and commitment to our clients. We are available when needed, flexible in our scheduling to fit in clients who can only meet on evenings and weekends, and we make location visits to hospitals and homes to accommodate your situation. Contact the Law Offices of Ginger West Johnson at 318-734-9905 to schedule your first appointment. We handle family law, criminal law and personal injury cases, and we are happy to make appointments at a time that is convenient for you.